alaTest has collected and analyzed 123 reviews of Panasonic SAPMX82 (Black). The average rating for this product is 4.7/5, compared to an average rating of 4.1/5 for other Audio Systems for all reviews. We analyzed user and expert ratings, product age and more factors. 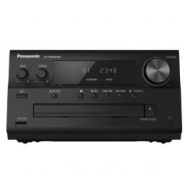 Compared to other Audio Systems the Panasonic SAPMX82 (Black) is awarded an overall alaScore™ of 89/100 = Very good quality. I recently purchased this and and very pleased with its performance. It's just the right size and fits well where we have it. Good sound, exactly what I needed. Wanted small system for conservatory. I listen to a wide range of music, classical, brass bands, pop and rock.this handles it all along with the Warfdale speakers. Very happy with purchase - good product for price range. Bought before Christmas and set it up very quickly for connection to various family members' iPhones etc via bluetooth. Great sound. Nice little stereo with plenty of functions, and a very good sound for the money. Bought with Tannoy Mercury 7.2 speakers. Sound quality - superb. Very happy with DAB+ radio - spot on. Good value and sounds great. Seems to do everything on the label, and takes up a quarter the space of its predecessor. Happy with the purchase as a budget buy, but speakers lack definition to me, although they were very cheap. Will probably upgrade speakers shortly.